This classic goes out to my petite amie over at the function key. Take them bowling! We discovered this rather unwieldy note on my bf’s front windshield, as we left Kitty O’Shea’s after Sunday night pub quiz. We parked in our usual spot near the corner of Charnock and Prospect. We were taken aback that someone would take such care to write such a venomous note but wouldn’t bother to get some signage installed, to insure their elderly mother’s safety, which they’re so concerned with. There’s absolutely no indication that parking in this spot would make life difficult for anyone. A simple sign on the house’s front gate would do the job. But it’s our fault for not being psychic. This may come as a shock to you. But yes there are other people in the world besides yourself. The first person that come to mind is my 92 year old mother. 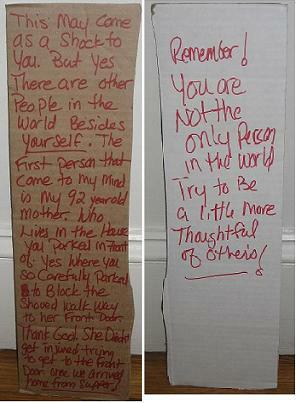 Who lives in the house you parked in front of. Yes where you so carefully parked to block the shoved walk way to her front door. Thank god. She didnt get injured trying to get to the front door. Once we arrived home from supper! Remember! You are not the only person in the world try to be a little more thoughtful of other’s! Better late than never: 123 Party! Book this Boston-based dance revolution to crash your next company meeting, bar mitzfah, intervention, etc. Never ever doubt the dance. No, like, seriously. Don’t doubt it. Evah. 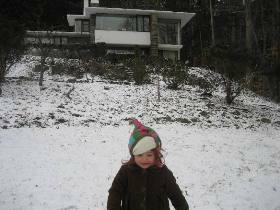 Behold, my stylish petite friend Lucia in front of her family’s Frank Lloyd Wright rental in Ithaca. Indoor gardens, radiant heat stone floors, and a massive fireplace made this house a tremendously relaxing snowy hideaway. Fantastic weekend! Woe unto the girl who denies her instinct to walk through the freezing rain to her doctor’s appointment. And woe unto that same girl for dialing Beverly, Massachusetts’ alleged taxicab service Cab Express. I figured 30 minutes was enough lead time for a cab to pick me up and drive me the mile to my new doctor’s office. But no. No, that was not enough time for Cab Express. After three phonecalls, 40 minutes, and some over-caffeinated aggressive pacing, I finally threw in the towel, rescheduled my appointment, and cancelled the phantom cab. Had I walked, I would have made it with time to spare. But I chose to call Cab Express, so there’s nobody to blame but me. Hell, at least I don’t have to go out in the rain. Ugh, wake me when something happens. As dull as it is stylish, Blowup was a great disappointment to me, squandering the efforts of Vanessa Redgrave, Jane Birkin, Sarah Miles, and Verushka. The plot was so uneventful, that I found myself focusing instead on the luscious bits of modernity and bohemian flash scattered around the various sets. Released in 1966, this supposed murder mystery drips with hipster style and fashion fashion fashion, as David Hemmings’ mod photographer tries to determine whether he inadvertently photographed a murder, while navigating swarms of leggy shaggable wannabe models in vivid swinging London. But there’s only so much surrealist intesity I can take. Pretty vacant. Grade: D+.